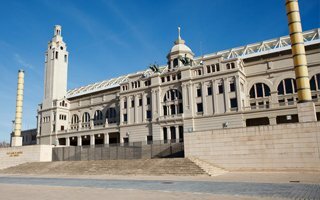 Barcelona: What next for abandoned Olympic Stadium? By year end we should know what strategy the city of Barcelona will implement to secure any sustainable use for the empty Olympic Stadium. For the last 25 years no such solution was found. Just last year Barcelona celebrated the 25th anniversary of the 1992 Olympics. But while memories are beautiful and well alive, the Olympic Stadium itself is the exact opposite. Well, it's still beautiful, but not alive at all. Almost nothing is going on at Estadi Olímpic Lluís Companys. The ground has in recent years been most well known for Espanyol's football games. However, the team was there only temporarily, until their new stadium, currently named RCDE Stadium, opened in 2009. Earlier there was an approach to American football with the Barcelona Dragons team, which was disbanded in 2003. Final attempt to bring the stadium back to life came in 2014, when the Open Camp project was announced. It transformed the Olympic Complex into a theme park in which guests were able to feel like actual Olympians. However, the project never reached its estimated scale. Instead of annual turnout of 23 million people it attracted just 1.4 million and ended up owing significant amounts of money to the city before being put on hold last year. This, once more, leaves the Olympic Stadium empty and heavily underutilised. This of course doesn't mean it doesn't cost any money. Maintenance cost runs in seven figures, which is why opposition in the city council has demanded for a solution to be found. Currently the municipal subsidiary Barcelona Serveis Municipals is running analyses of potential future use strategies. By the end of 2018 a scheme is expected that will indicate which direction is best for the building.